U, V, W and Z are at the end of the alphabet, but they are important beginning sounds for your student to learn! In this worksheet, he’ll write the first letter of the word that matches the picture. 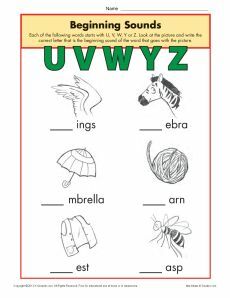 The worksheet follows the Common Core Standards for Phonics and Word Recognition for kindergarten and Phonological Awareness for first grade. Other grades may also find it helpful.